This pizza crust is fast, easy, delicious, and healthy! 1. Preheat oven to 375 degrees F. Coat 12-inch pizza pan with nonstick cooking spray; set aside. In medium bowl combine yeast and sugar. Stir in water, oil, and salt. Stir in flours and oats. Cover; let stand in warm place 20 minutes. 2.With damp hands press dough into prepared pan- dough will be sticky. Bake 15 minutes. While it bakes, prepare your pizza toppings. 3. Remove crust from oven and add toppings. I made Margherita Pizza: spead crust lightly with your favorite pizza sauce, fresh mozzarella, thinly sliced tomatoes, and a sprinkle of parmesan cheese. Bake for 15 more minutes. Top with fresh basil and serve. This pizza may have been taken to some of these great parties! Oh, Joy! That looks fantastic! Pinned it! :) Also, I can't wait for tomorrow to come back & link up with you guys! :) It'll be my first Let's Get Social! Also, thanks so much for sharing this with us at the Show Off party! OMG! That does look delicious! I really have to start growing fresh herbs! It really is good....it would be a fun project to bake with Amara! I love growing herbs...I don't have enough sunny spots to grow many, but I always grow Rosemary and Basil! :) Thanks for coming by!! Yum! We are having pizza for dinner tonight! Not as healthy as yours though! This looks great - of course all of your goodies do! I am a big fan of pizza and this certainly looks delicious! Good Morning Joy!! What a beautiful Blog you have!! Following you from the Sunday Social!! Thanks so much for providing this forum!! I'm your newest follower here and on G+!! I hope you had a beautiful weekend and are enjoying your Monday Morning!! Your pizza crust looks fabulous, Joy! I love that it has so many wholesome ingredients, especially the oats. Love your basil plant too. Thank you for sharing this delicious and nutritious recipe with the Hearth and Soul hop. Thank you for hosting Hearth and Soul! This looks delicious! Stopping by from In and Out of the Kitchen. Would you mind to link this on my blog hop? I think our readers would love to see this. Thanks, Joy! What a hearty dough recipe. Your pizza looks mouth watering! Thanks for sharing at Simple Supper Tuesday. Danielle, you put a great feature together- thanks so much for including my recipe!! Hope you're having a wonderful week! Oh! This makes pizza do-able on a weeknight. Thanks for sharing with See Ya in the Gumbo, Joy! No knead! Pinned and thank you - I am in on this recipe, Joy :-) Thank you for sharing at our All My Bloggy Friends Party ! Oh yum, this looks fantastic! I love such easy crust recipes! :) pizzas look really good! Now I want pizza for breakfast! I should NEVER look at food posts before breakfast. This is fabulous! My husband has been on an oat kick lately and he is going to love using them in a pizza dough. Can't wait to try this, pinning right now. :) Thank you for stopping by Tasty Tuesdays! :) Thank you so much for linking up with me this week at Tasty Tuesdays! I’ve pinned this & shared it with my followers! WOW!!! This look delicious. I need to make this soon. Hi Joy! We love pizza in our house. This crust version takes much less time than ours. Thanks for sharing it with us at Our Little Family Adventure's Friday Facebook Community Party. It's always great to have you join us. We just loved your post and your blog and we're so glad to have you join us at our One Sharendipity Place Link-up Party this past weekend!! It has been so much fun finding your site and others like yours out there!! We hope you'll join us again this weekend!! Looks pretty tasty! Cant wait to actually taste one and to actually love it. Rachel, if you try it, I hope you enjoy it as much as we do! :) Thanks for dropping by! Looks great and I love the idea of no kneading! Thanks for linking up with Foodie Friends Friday! Sharing on my Walking on Sunshine FB page! Thanks for linking up last week, I appreciate you! 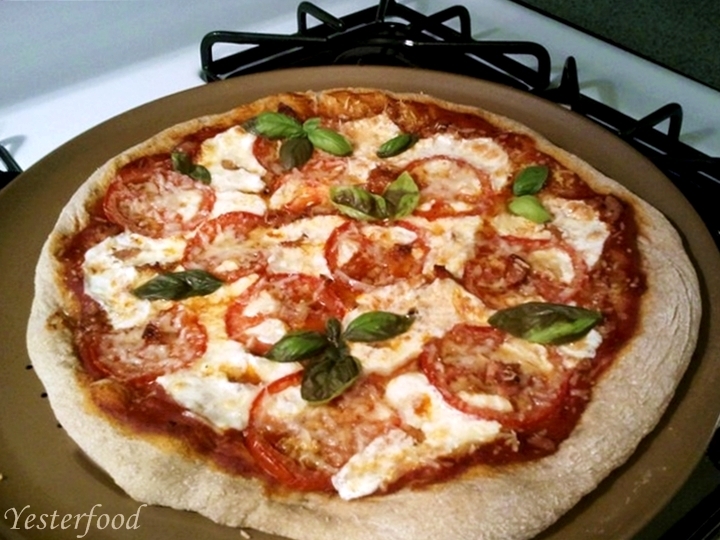 Can you suggest a recipe for no knead pizza that uses only whole wheat? I am so salivating for a slice of your pizza Joy! Pinned and shared!